The submission reveals for the first time that U.S. federal prosecutors have in the last few months formally approached people in the United States, Germany, and Iceland and pressed them to testify against Mr. Assange in return for immunity from prosecution. Those approached are associated with WikiLeaks’ joint publications with other media about U.S. diplomacy, Guantanamo Bay and the wars in Iraq and Afghanistan. The joint publication effort between WikiLeaks, The New York Times, McClatchy, The Guardian, The Telegraph, the UK’s Channel 4, Al Jazeera, The Bureau of Investigative Journalism, Der Spiegel, Le Monde, El País, The Hindu, and Reuters, among others, won numerous journalistic awards and created the collaborative model subsequently used for other large disclosures such as the Panama Papers. The Trump Administration has been intensifying efforts against Mr. Assange in the Grand Jury against WikiLeaks, which has been empanelled in the Eastern District of Virginia since 2010. The Administration has been plagued by leaks of classified information in its first two years, and is clearly intent on using the prosecution of Julian Assange as an “icebreaker” to set a dangerous precedent that would enable the prosecution of most serious media organisations, such as The New York Times, the Washington Post, AP, CNN and NBC which routinely obtain and publish information from classified sources. The Inter-American Commission on Human Rights, which is the equivalent of the European Court of Human Rights, will intervene if it considers that actions by U.S. and Ecuador give rise to an urgent, serious situation that will cause irreparable harm to Mr. Assange. The application by Mr. Assange’s lawyers identifies a raft of legal obligations that the U.S. and Ecuador are flouting in their treatment of Mr. Assange. The lawyers document Trump Administration attempts to pressure Ecuador to hand over Mr. Assange, notably recent serious overt threats against Ecuador made by senior U.S. political figures, unlike the more veiled threats made in the past. Threats have significantly increased since WikiLeaks published the “Vault 7” documents from the CIA –the largest leak of CIA classified information in history, which the U.S. government claims were provided by a young CIA officer, Joshua Schulte. 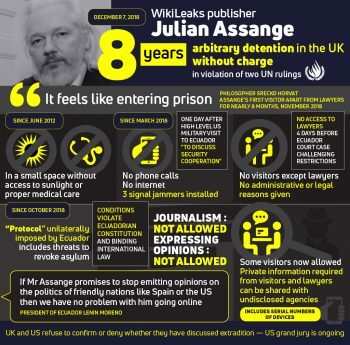 The application also highlights espionage operations against Mr. Assange in the embassy in London by the specialized security services contracted by Ecuador which, instead of being involved in protecting the asylee, have spied on Mr. Assange and his visitors. According to media reports, the company has also been acting as an informant to the U.S. authorities, specifically the FBI. Among the serious actions denounced in the application are Ecuador’s executive gag order against Mr. Assange and its interference with Mr. Assange’s access to his lawyers, affecting his right to a legal defense. “Ecuador is required to end the regime of isolation imposed on Mr. Assange, suspending the application of the so-called special protocol and guaranteeing his rights as an asylee will be respected in full”, the filing states. In December the New York Times reported that Ecuador’s new president, Lenin Moreno tried to negotiate the handing over Mr. Assange to the U.S. in exchange for “debt relief”. In relation to the United States, the submission highlights the serious implications for media freedom in the US from the unprecedented attack on the right to publish truthful information represented by the US sealed process against Mr. Assange and WikiLeaks. NOTES The Inter-American Commission on Human Rights (IACHR), based in Washington D.C., is an organ of the Organization of American States (OAS), whose mission is to promote and protect human rights in the American hemisphere. See What is the IACHR? The UN Working Group on Arbitrary Detention’s statement calling for Assange to be set free, 21 December 2018. See UN experts urge UK to honor rights obligations and let Mr. Julian Assange leave Ecuador embassy in London freely. This article was crossposted from Popular Resistance.